Romaine lettuce and croutons dressed with an emulsion of lemon juice, olive oil, egg, Worcestershire sauce, garlic, Dijon mustard, Parmesan cheese, and black pepper. In its original form, this salad was prepared and served tableside. Anchovies were later added to the recipe but Mr.Cardini wasn’t happy about it at all as he thought that the Worcestershire sauce had enough fishy taste. All the same, nowadays almost all the Caesar Salads recipes list Anchovies as one of the main ingredients. This one, however won’t. 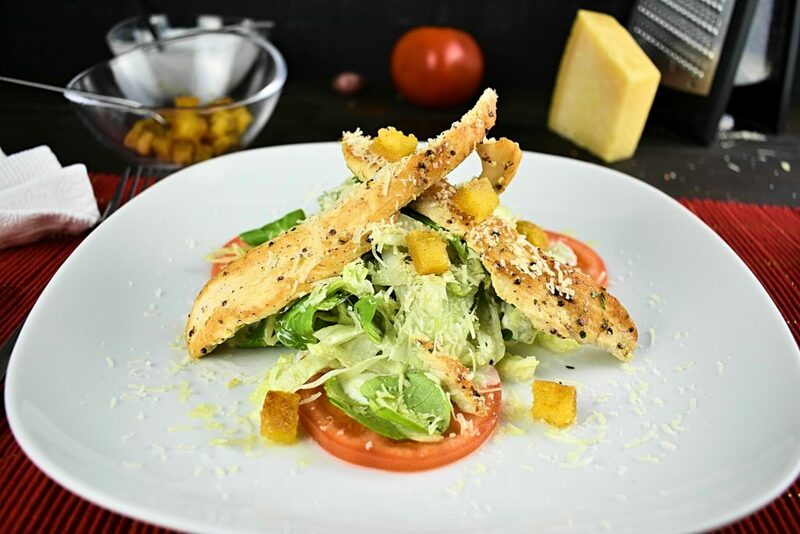 As there was mentioned there is no such thing as Chicken Caesar Salad so this recipe will not be a Ceasar Salad rather than a Chicken Salad that will look a bit like Caesar Salad. This is mainly thanks to the grated parmesan or gran padano and the croutons. 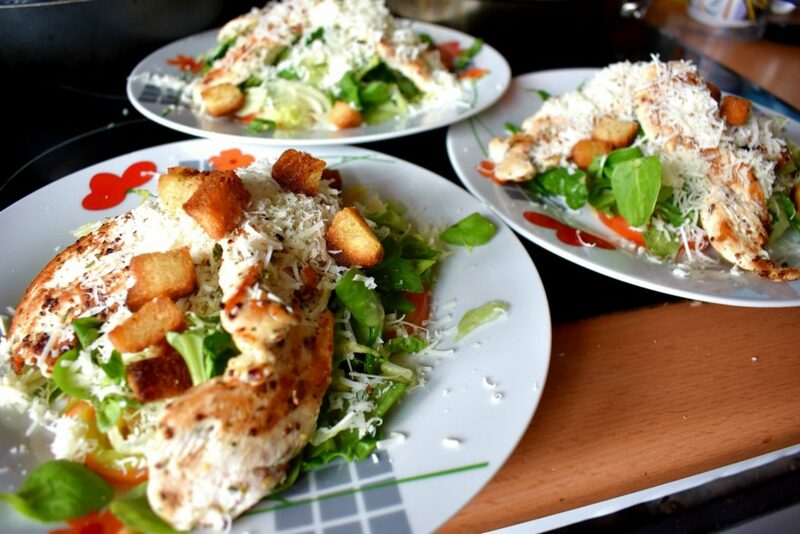 Probably this is the only common thing among the variety of existent Caesar Salad recipes out there. Conclusively then this is what makes this dish what it is. 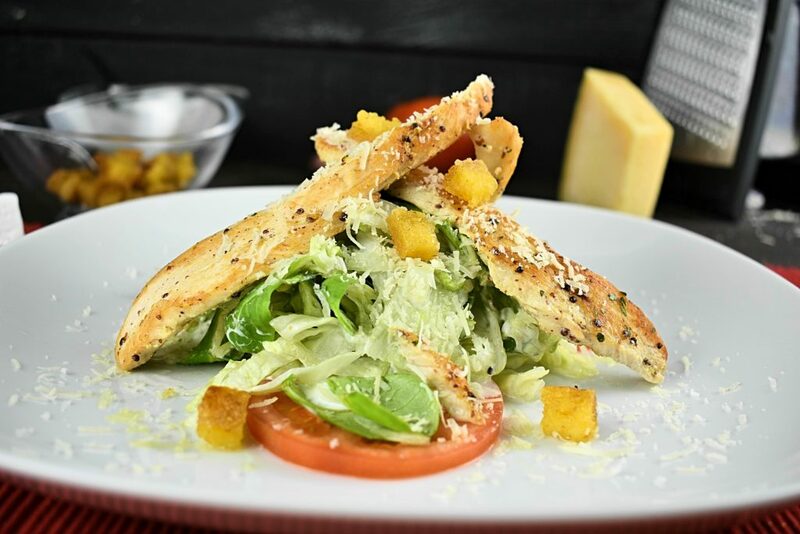 Grated hard cheese with fried bread pieces on some random bunch of salad is all it takes to whip up a delicious healthy lunch or dinner. The original recipe calls for Romaine salad but if you only have Iceberg at home, don’t panic. Use what you have -like Cardini did- and it will be fine. Even better if you have a selection of leafy greens in your fridge to choose from. It’s always better to mix a couple of stuff together than to go on solo. 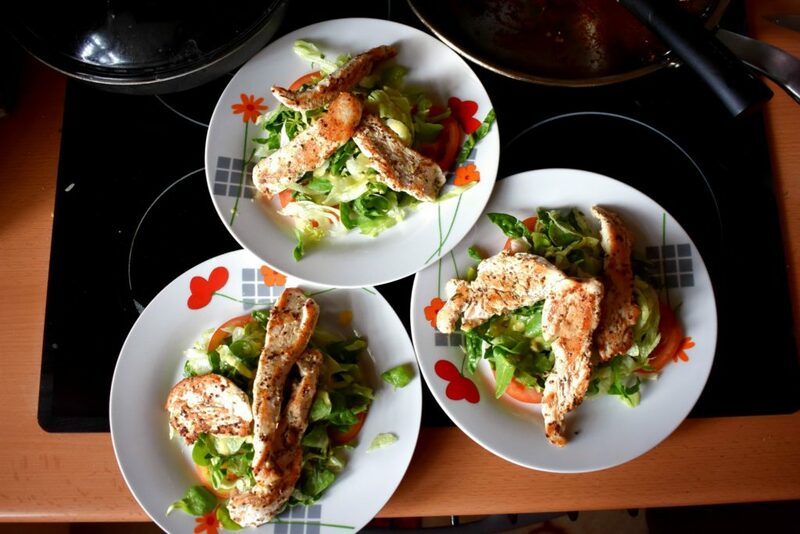 Amazingly simple, quick and delicious. 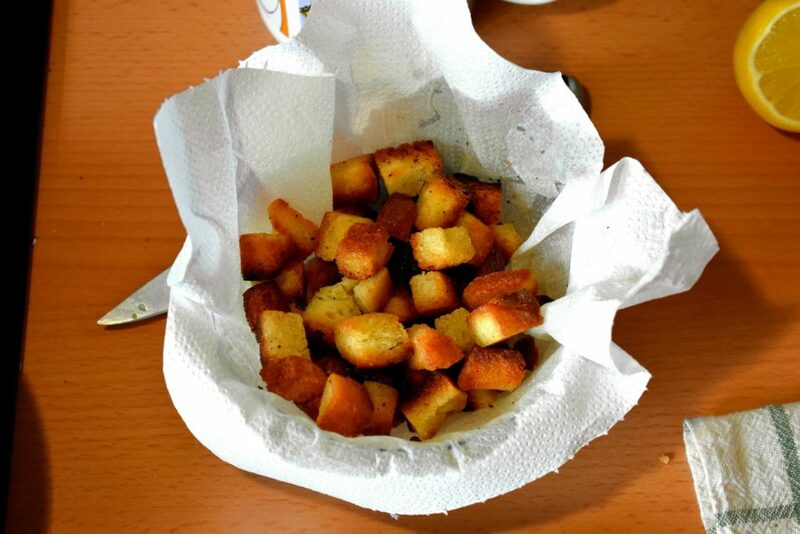 You can easily go gluten free with corn bread croutons that you make fresh or you use some of the leftover from your arepas. To our greatest regret there is no hope for those on a keto or carbs free diet but omitting them entirely. Don’t loose sleep over it, the dish will be just fine without them too. 1. 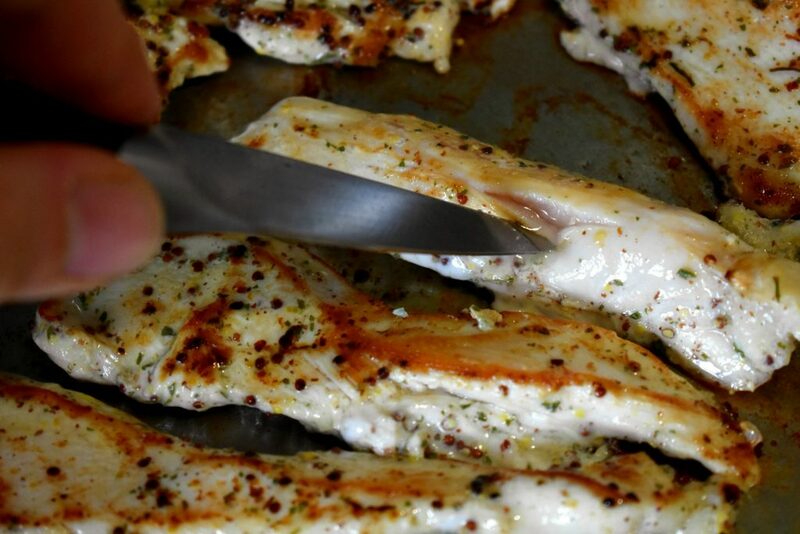 Cut the chicken breast into long 1/2 inch / 1.25cm wide slices. Roughly as wide as a pinkie. 2. 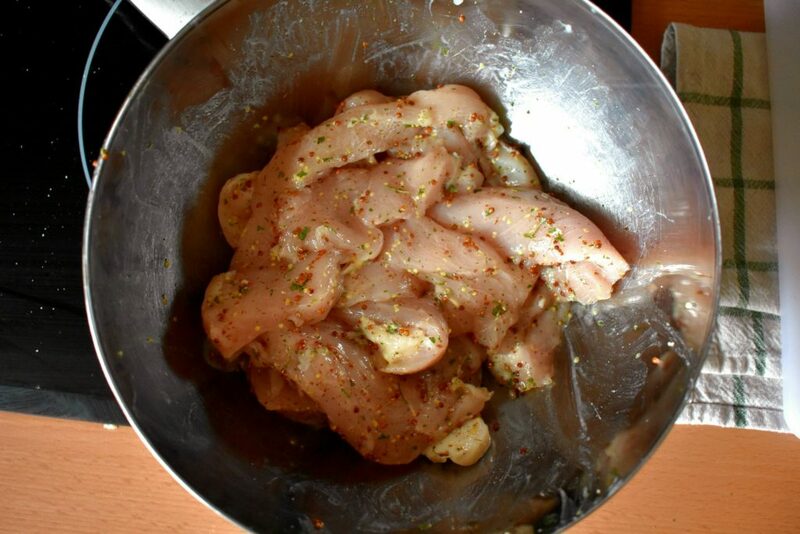 In a bowl mix together the chicken breast stripes, mustard, parsley, salt, lemon juice, oregano and black pepper. 3.Fry one side of the chicken breasts in a frying pan until golden brown at the bottom and starting to see the meat turning white at the edges on the top, then flip them to the other side. If this is your first time ever frying chicken breast then try them on medium-high heat and go from there. If you fry them on too low temperature then the meat will dry out before it reaches the golden brown colour. If the hob is on too high temperature then you run the risk of burning the outside while not having the inside cooked enough which is actually a real cause for concern with poultry. Always check if the inside is cooked properly by making a small cut at the thickest part to peep inside. If you see no blood or pinkish parts then it’s good to go. In both cases you may try to put a lid on the meat which will help to cook it properly and it will keep the meat moist as well. Unfortunately, this little lid trick although saves our dish but takes the edge of the flavour away so use it sparingly and master the temperature selector. 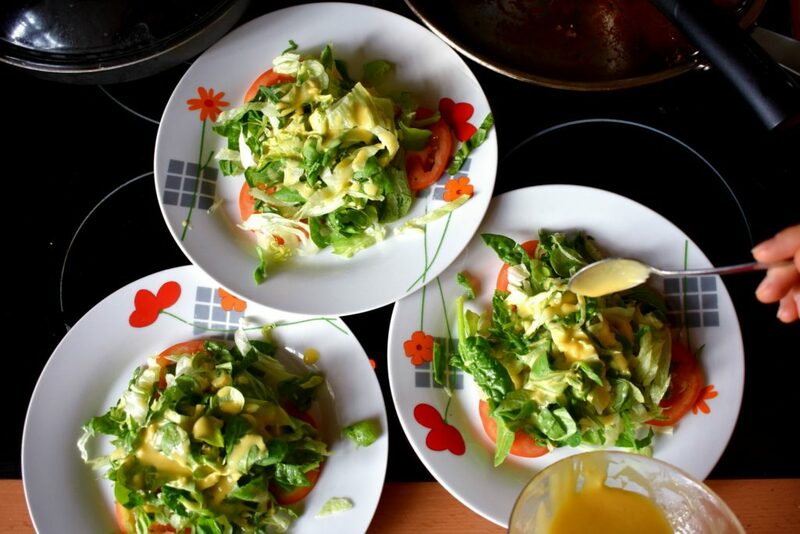 While waiting for the chicken to tan we are free to prepare the salad. 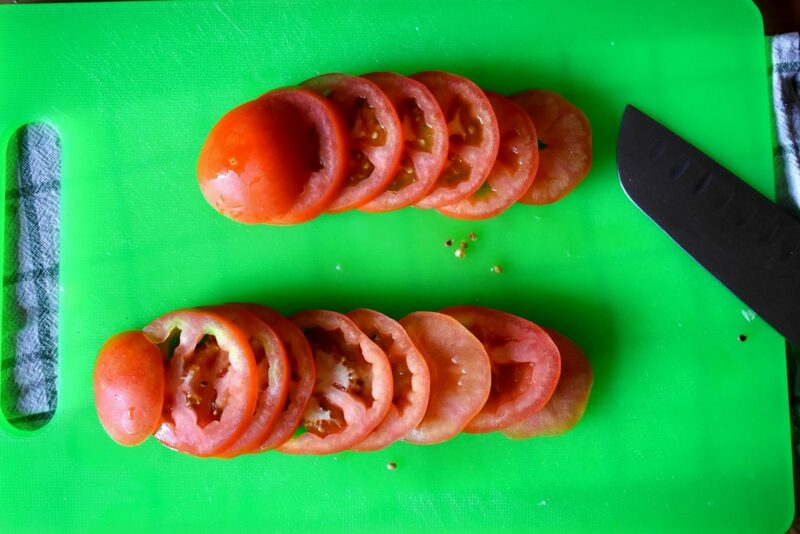 With a sharp knife cut thin slices of tomato. Place three slices next to each other in the middle of each plate. Chop up your salads of your liking. Some like it thick others fine and the original recipe calls for whole leaves. Pick your size and after cutting and mixing them together put a handful of it onto the top of the three slices of tomato that have been just placed on the plate. Try to maintain some height. Salad doesn’t look good flat on a plate. Build it up as high as you can. Some like the dressing mixed together with the salad others like to put their own dressing on. 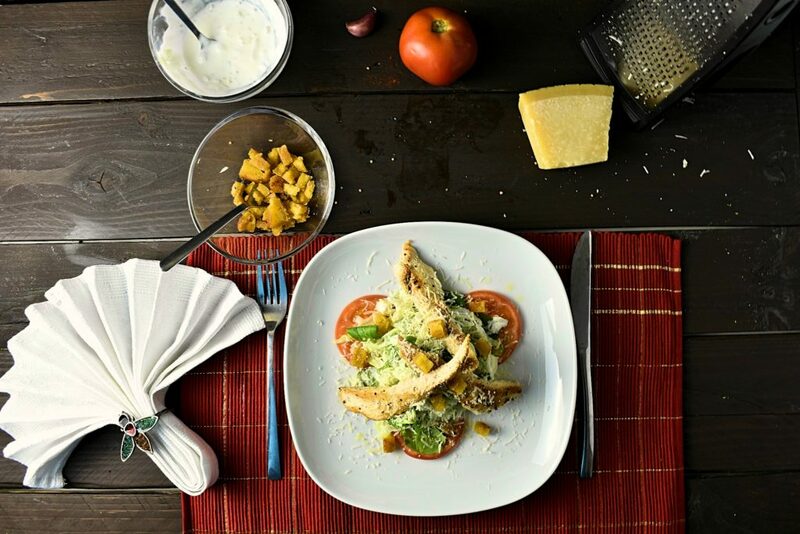 If you prefer mixing everything together then add the dressing to the salad before placing it on the plate. Chop garlic and add a pinch of salt. Use a fork to mash it into a paste then scrape it into a medium bowl. Whisk in egg yolks, 2 Tbsp. lemon juice, and mustard. Adding drop by drop to start, gradually whisk in olive oil, whisk until dressing is thick and glossy. Stir in Parmesan, as well. Season with salt, pepper, and more lemon juice if desired. Pour it over gently on top of the salad using a spoon. Put olive oil into a preferably small frying pan and heat it up to medium. Place them on a kitchen towel or some dried bread to cool. Around this time we should have the chicken ready to place it on the salad. 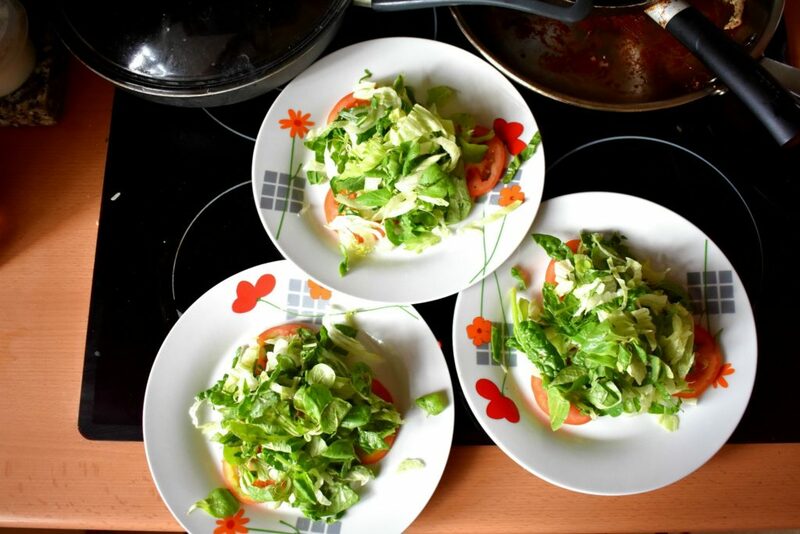 Try to maintain the height of the salad as much as possible. 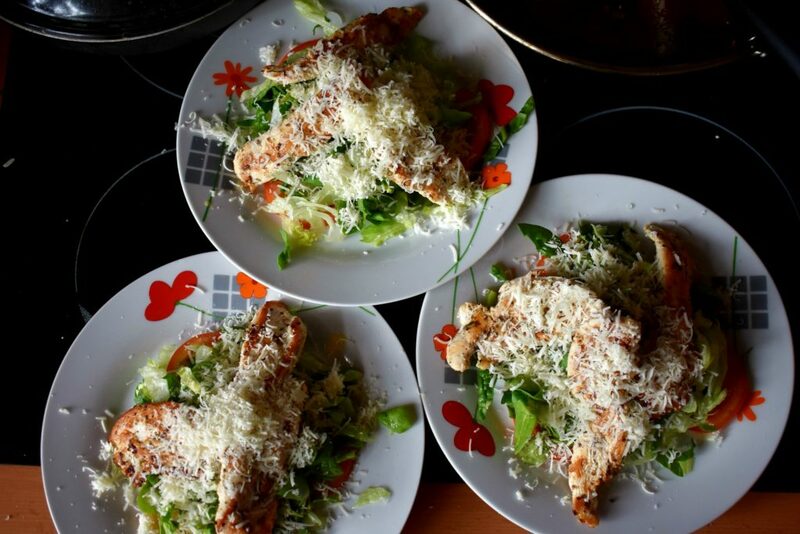 Sprinkle grated Parmesan on top of the salad and chicken. 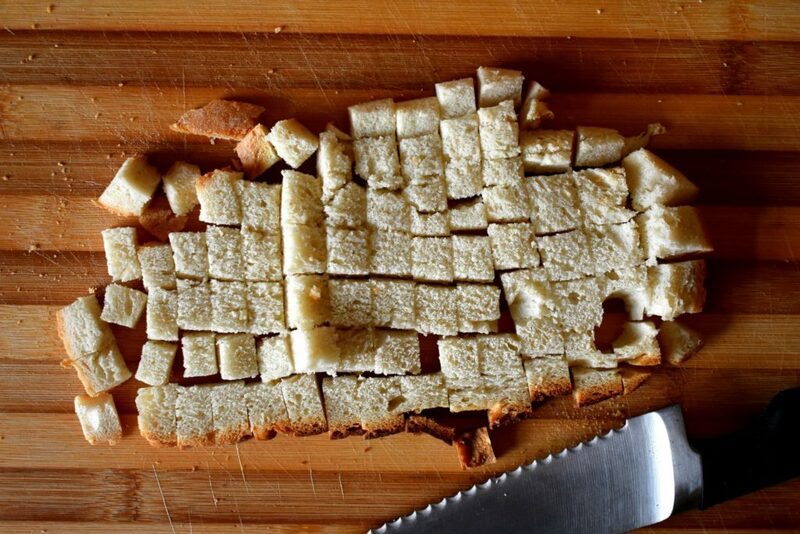 Sprinkle croutons on top of the cheese. 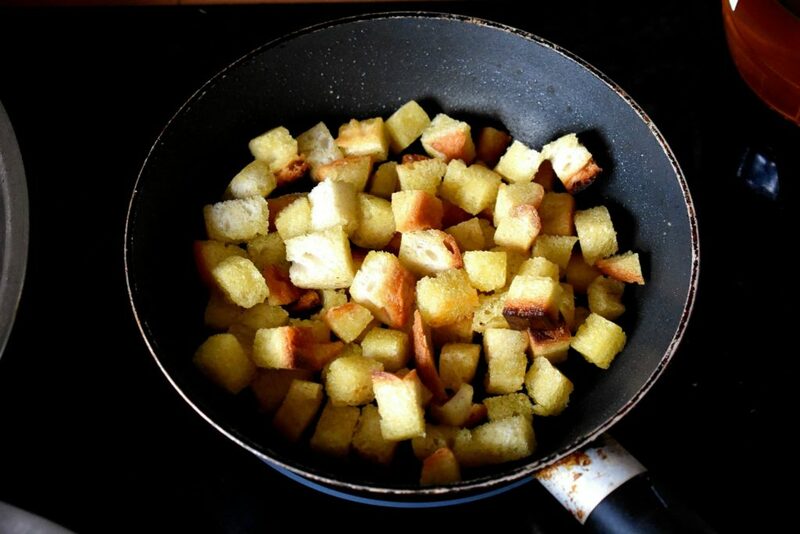 You can easily go gluten free with corn bread croutons that you make fresh or you use some of the leftover from your arepas. To our greatest regret there is no hope for those on a keto or carbs free diet but omitting them entirely. Don't loose sleep over it the dish will be just fine without them too. 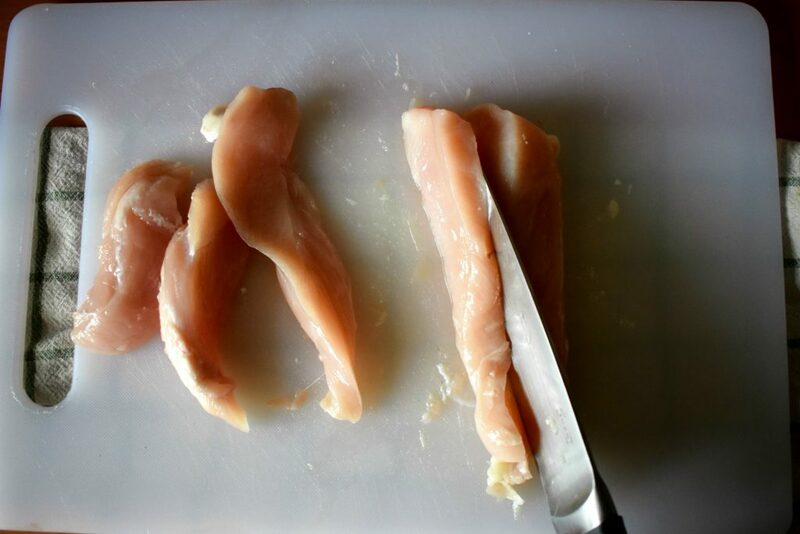 Cut the chicken breast into long 1/2 inch / 1.25cm wide slices. Roughly as wide as a pinkie. 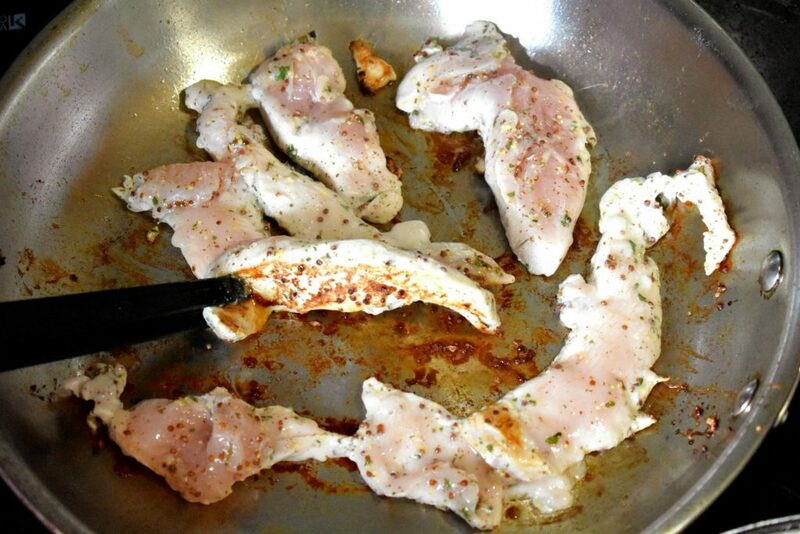 3.Fry one side of the chicken breasts in a frying pan until golden brown on the bottom and starting to see the meat turning white at the edges on the top, then flip them to the other side. 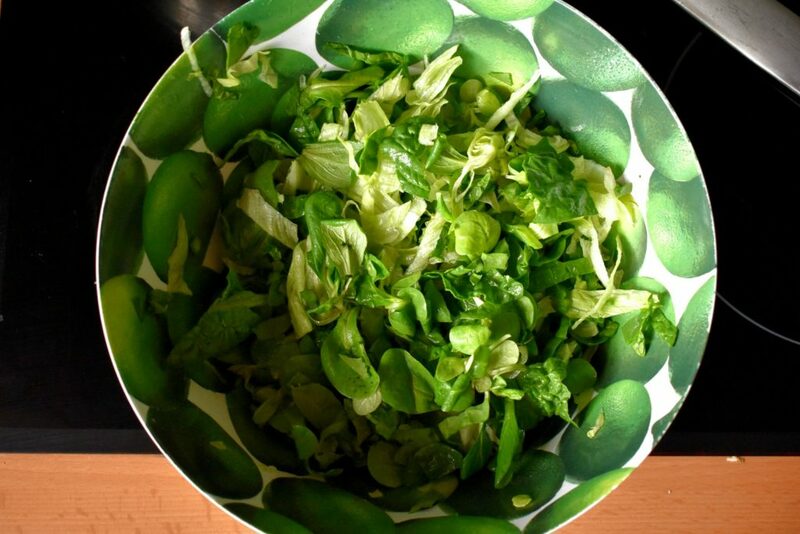 Chop up your salads to your liking. Some like it thick others fine and the original recipe calls for whole leaves. 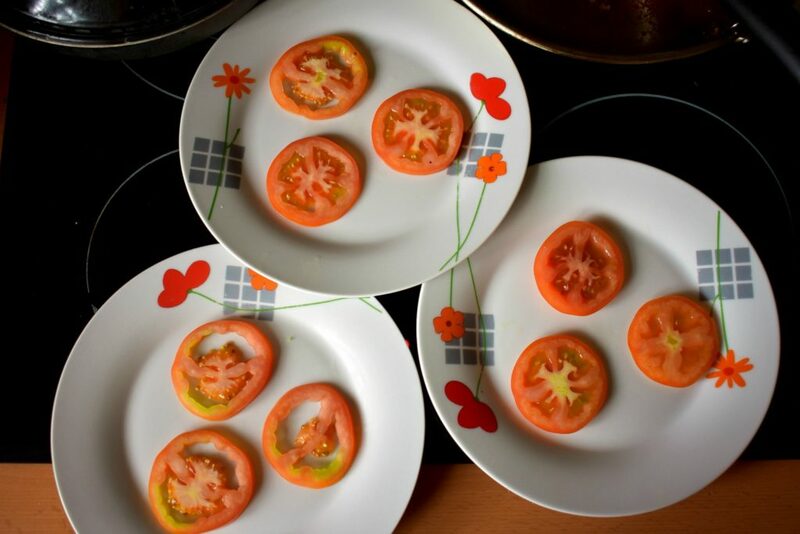 Pick your size and after cutting and mixing them together put a handful of it onto the top of the three tomato slices what we have just placed on the plate. Chop garlic, and add a pinch of salt. Use a fork to mash it into a paste, then scrape it into a medium bowl. Season with salt, pepper, and more lemon juice, if desired.